Available in walnut and other types of wood on request. 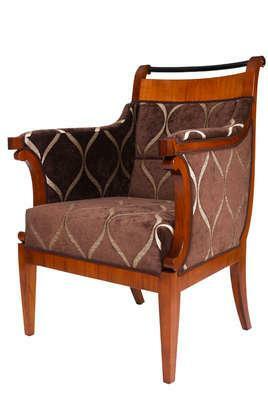 Viennese Biedermeier Armchair with tapered front legs, curved back legs, spruce wood carcase inside, curved and veneered backrest, curved material-covered armrest, with solid wood curved armrest support, upholstered with a 3-layer upholstery material on no-sag springs, back padded with straps and upholstery material/fleece, outside surfaces covered with material on board support, single-colour braid trimming. Available in cherrywood, walnut, and other types of wood on request.